The person who commissioned this plane is no longer with us and I am not sure who owns this plane now. I did not stamp my name on it as it was not my design. With the wedge on runners it works well and is comfortable to use. Now I have dug the photo out it looks better than I remember and there could be possibilies with this design. Hello K ,is the wedge located with side lugs ( runners ) ? It does look very comfortable to fit in the hand . Personally I think it looks a dream ,am I happy I asked .thank you for posting the photos . The runners are basically similiar to the old drawer runners, a 1/4″ square fillet of mild steel. There is a groove either side of the wedge corresponding to the runners. Primative but it works. See the answer to Scott’s question. 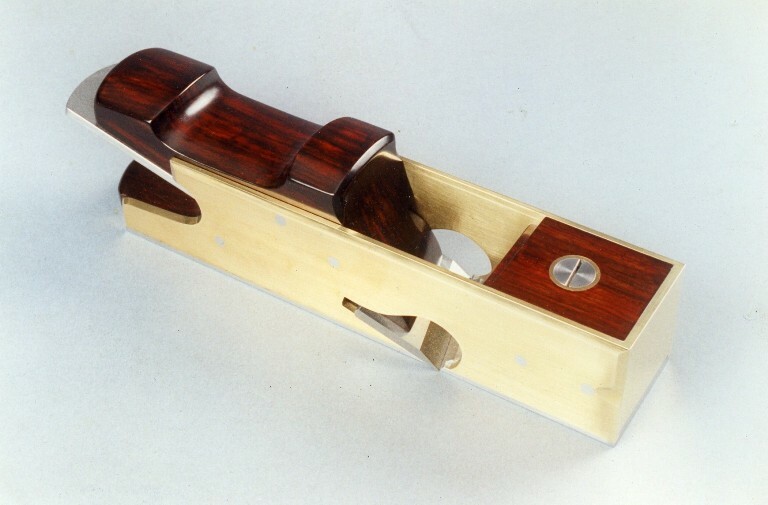 It is very comfortable and the best ergonomic solution I have seen using a wedge in a mitre plane. Wedges are more ergonomic than lever caps in mitre planes.